This house is going to be exciting for me (are you sick of me saying how excited I am?? I'm just so freaking excited!!!). I have always loved a good challenge, and this is going to be a very challenging project. Why, you ask? I am totally stepping into a new zone, creatively, with the style of this home. I want it to be young, hip, fresh, clean, yet collected and storied. It is going to be a merging of things I love and things that I may not have tried before. I am already falling in love with the direction I see it going in my mind, so I can only hope that it translates into the final product and some uber cool couple or person feels the same way. I want them to feel like it is the only thing like it around and that they most likely won't find anything else like it. Did I mention I am staging this house like I did with Lexington? I think it is crucial to portraying the whole story for this home and I really look forward to that part of it. 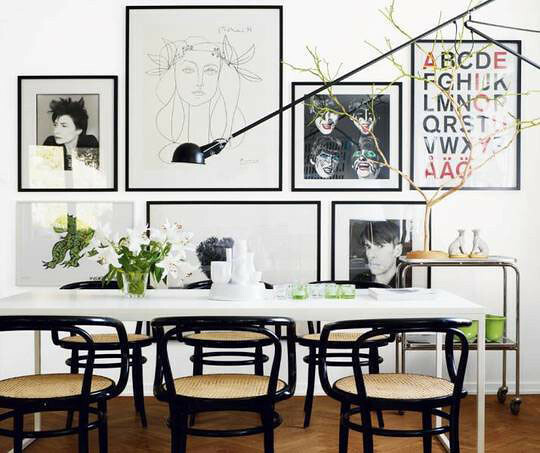 Here are few snapshots that have set the vibe for the dining room. This picture sums up my current dream space. Clean, crisp and fun. After doing a ton of scouring around I decided that this School House Electric light would be the perfect solution to our problem: we need lots of bulbs, and it has to be swag-able (moving and creating new light-boxes is not cheap or fast! I need both). Scott at School House Electric is amazing and is having the factory make it possible for us to swag it properly with adjusted cords lengths. Those guys rock! We are ordering it in white and I think it will be an understated but stylish addition to the dining room.